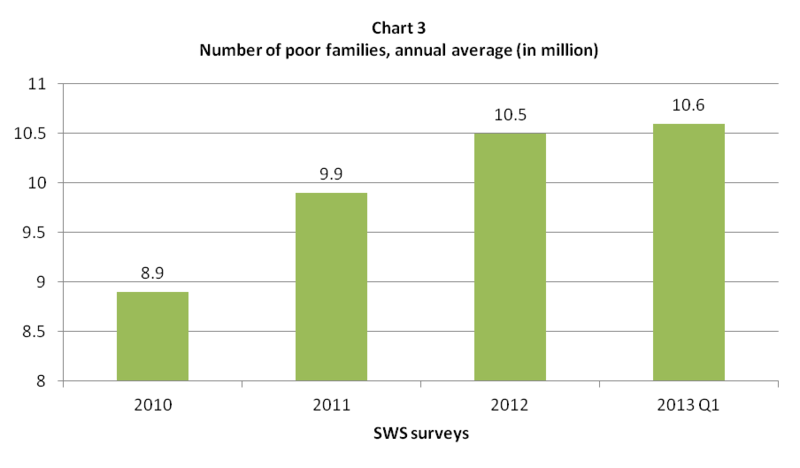 Two weeks before the fourth State of the Nation Address (SONA) of President Benigno Aquino III, the National Statistical Coordination Board (NSCB) revealed that the income gap between the rich and poor in the country continues to widen. The high-income class saw their income grow much faster (10.4% between 2010 and 2011) than those of the middle (4.3%) and low-income (8.2%) groups. To be sure, the NSCB’s “revelation” is nothing new, but nonetheless, it affirmed widespread criticisms that the economic growth being hyped by the three-year old Aquino administration merely benefited the rich and has been meaningless to the poor. But as always, Malacañang was quick to dismiss any claim that challenges the illusion of economic prosperity it is trying to sell, even if it comes from an official government body like the NSCB. The gap is not widening, said the Palace’s chief spokesman, because all income classes have posted growth. Never mind if simple math says that a 10%-increase in a company executive’s monthly salary of P200,000 and an 8%-increase in an ordinary employee’s monthly income of P10,000 means that their income gap has widened by P19,200 a month. There is a serious problem when government readily distorts basic facts and logic to suit its propaganda. 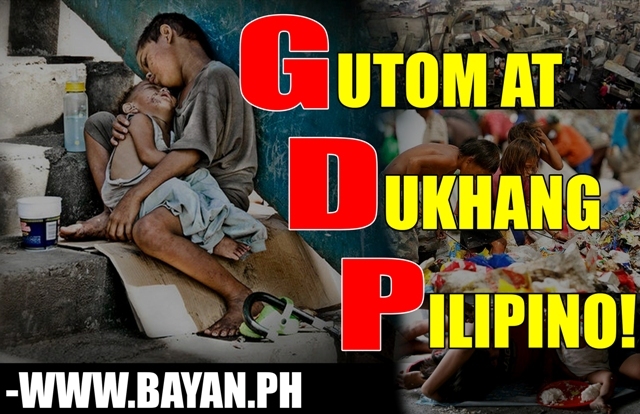 Indeed, the glaring reality in the first three years of the Aquino administration is that the number of poor and hungry families and jobless workers has been constantly rising while a handful of super-rich amass wealth at unprecedented levels. All the publicity about high gross domestic product (GDP) growth, unparalleled trading in the stock market and historic investment grade rating merely points to how profitable the economy has become for the country’s elite and their foreign patrons. This phenomenon can only be adequately explained by examining the political and economic structures of Philippine society. For starters, Aquino did not re-orient the economy and created conditions that will dismantle its semi-colonial (i.e., export-oriented, import-dependent economy) and semi-feudal (i.e., vast countryside with backward production and intense land monopoly) character. Industries remain stunted and vast haciendas remain intact depriving millions of Filipinos of long-term, gainful and productive employment and livelihood. Infrastructure development, which has become the favorite investment destination of big compradors and foreign banks and corporations under Aquino’s public-private partnership (PPP), is being pursued not for national industrialization but to facilitate the plunder of the economy by big local and foreign business interests. This also explains why Aquino’s “kung walang corrupt, walang mahirap” (without corruption, there is no poverty) is fundamentally flawed and deceptive. Such underlying reality is being aggravated by the neoliberal policies of privatization and deregulation that result to ever rising prices, with big business groups and families that control privatized and deregulated sectors of the economy massively accumulating wealth while the people are oppressed and impoverished by soaring cost of living. This has been one of the easily discernible trends in the first three years of the Aquino presidency. Note that the costs of water, power and oil products are rising at a much quicker pace today. The mentioned 4.3% inflation rate of utilities and fuels posted in the first three years of Aquino is faster than the 3.4% recorded in the last three years of Arroyo. It does not mean, however, that Arroyo was better than her successor at keeping prices in check. They both adhere to the same neoliberal policies of privatization and deregulation that let prices spiral. It’s just that Aquino is a more ardent implementor of neoliberalism than his former Economics teacher at the Ateneo. Prices have soared as government ditched its regulatory duties like in the case of oil, and turned over to profit-oriented private firms many of its key functions like in the case of water and electricity. These paved the way for the profiteering of huge private monopolies. Among the first challenges to Aquino when he assumed power was to reverse these neoliberal prescriptions of the International Monetary Fund (IMF) and the World Bank that his mother Cory first implemented in the late 1980s. Alas, when pump prices escalated in 2011, Aquino immediately defended the Oil Deregulation Law amid mounting calls for price control. He also rejected demands to scrap or at least reduce the 12% value-added tax (VAT) on petroleum products as an immediate relief. For Aquino’s inaction on skyrocketing oil prices, youth activists popularized “Noynoying” or lazing around. (Read more on oil deregulation here) Under Aquino, the pump price of diesel has increased by 24%; gasoline, 17%; and liquefied petroleum gas (LPG), 7-14 percent. Since Aquino became President, the distribution charge of the Manila Electric Co. (Meralco) has already jumped by 43 percent. The transmission charge of the National Grid Corp. of the Philippines (NGCP) has already increased by 28 percent. Due to the imposition of the universal charge on stranded costs, the universal charge being imposed by Meralco has ballooned by 213 percent. Meanwhile, Malacañang has remained silent on the raging controversy surrounding the privatization contract of the Metropolitan Waterworks and Sewerage System (MWSS). But it is noteworthy that the Aquino administration has been showcasing the privatization of MWSS to lure investors to its public-private partnership (PPP) program. The public now understands why MWSS is such an appealing model to PPP investors. In their Concession Agreement with MWSS, Maynilad Water Services Inc. and Manila Water Co. Inc. have been allowed to pass on to consumers billions of pesos in past and future income taxes, corporate donations, advertisements, projects, etc. and earn guaranteed profits from such onerous charges. This is on top of automatic adjustments in the basic rates as well as the collection of questionable items. (Read more on MWSS privatization here) The all-in water tariff being charged by Manila Water has already gone up by 24% and Maynilad by 41% since Aquino took over. 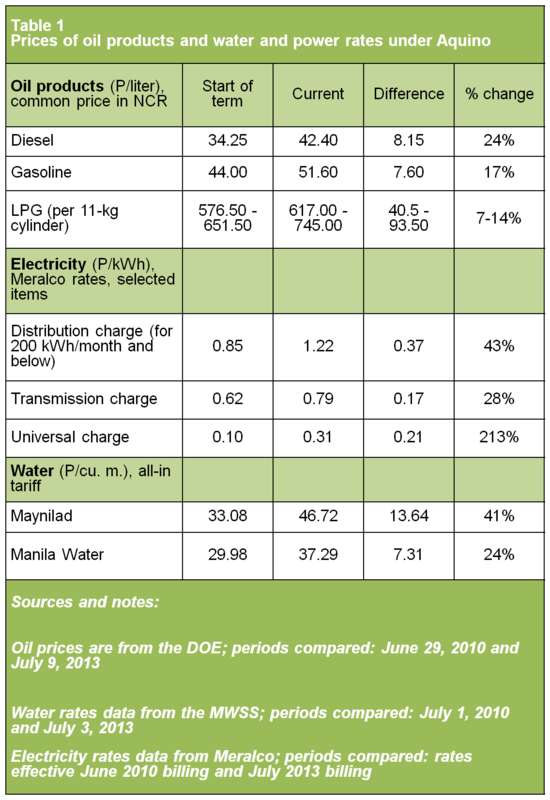 Table 1 below sums up the movement in prices of oil products and water and electricity rates in the first three years of the Aquino presidency. Tuition’s steady increase resulted in the high inflation rate of education. In the past three years, the Aquino administration approved almost nine out of every 10 applications for tuition hikes by tertiary schools. For this school year, the Commission on Higher Education (CHED) approved the tuition hike application of 354 tertiary schools and of at least 903 private elementary and high schools. In 2011 and 2012, CHED allowed 281 and 267 tertiary schools, respectively to increase tuition. Big business has been cashing in huge amounts of profits due to the ever increasing prices of basic goods and services (and continued depression of wages). Due to rising electricity rates, for instance, the net income of Meralco has been growing by 42% or P3.67 billion annually from 2010 to 2012 and that of the National Grid Corp. of the Philippines (NGCP), by 17% or P2.91 billion (from 2010 to 2011). Meanwhile, oil companies’ net income during the period has been weighed down by relatively lower prices in 2012. Petron’s net income, for instance, grew by 46% a year from 2010 to 2011 but declined by 73% last year, pulling down its annual net income expansion to just 7% in the last three years. Nonetheless, it still averaged an annual net income of P6.23 billion during the period. As an industry, electricity and oil and gas firms that belong to the top 1,000 corporations posted a collective 48% or P42.64 billion yearly net income growth from 2010 to 2011. Similarly, because of rising water rates, Maynilad’s net income has been increasing by 36% or P1.33 billion every year and Manila Water by 19% or P737 million from 2010 to 2012. Another indicator of the robust financial health of these firms is the gross profit margin. Among all industries in the top 1,000 corporations, electricity, oil and water companies registered some of the largest gross profit margins. In 2010 and 2011, the average annual gross profit margin of electricity and oil firms reached 32%, higher than the 27% they registered in 2008 and 2009. On the other hand, water firms posted a gross profit margin of 36.1% in 2010 and 2011, slightly lower than the 36.7% it recorded in 2008 and 2009. Other profitable industries include mining (50% profit margin in 2010 and 2011), banking and other financial activities (47%), information and communication technology (42%), and real estate (36%). All in all, the average gross profit margin of the top 1,000 corporations improved from 21% to 23% in the periods being covered. Also, their total net income grew from P755.97 billion in 2009 to P804.07 billion in 2010 to P868.08 billion in 2011, or an annual expansion rate of more than 7 percent. Not surprisingly, a small group of super-rich families, which together with their foreign partners and financiers, control the country’s utilities, energy and oil companies, banks, mining firms, and real estate and infrastructure development among others, are amassing unimaginable wealth. Forbes’ annual list of the world’s richest people shows a steadily and immensely growing wealth of the super-rich in the Philippines, who control the country’s largest companies, in the first three years of the Aquino administration. From $16.4 billion in 2009, the combined wealth of the 40 richest Filipinos has ballooned to $47.4 billion in 2012, or a 189%-increase. 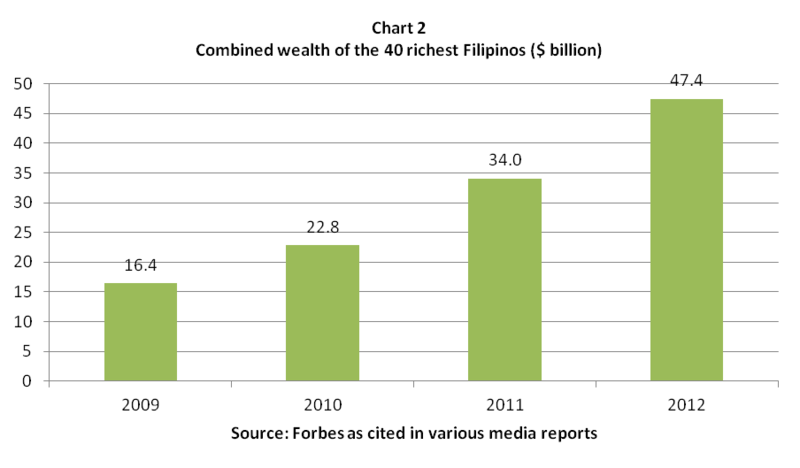 (See Chart 2 and Table 2) Forbes listed only 11 richest Filipinos for 2013 but their combined wealth has already reached a whopping $39.9 billion. Among the country’s richest based on the Forbes list is presidential uncle Danding Cojuangco, whose San Miguel Corporation (SMC) has stakes in Petron and Meralco as well Jaime Zobel de Ayala, whose many business interests include Manila Water. Cojuangco has a declared wealth of $1.4 billion in 2012, or 112% higher than his recorded wealth in 2009. Manned by his right-hand man Ramon S. Ang, Cojuangco’s San Miguel Corp. (SMC) registered a 61%-increase in its net income between 2010 and 2012. Originally a food and beverages company, the conglomerate has aggressively expanded into oil and energy (Petron, SMC Global Power Holdings, and San Miguel Energy Corp. and Meralco) as well as infrastructure. Taking advantage of Epira, SMC now holds the largest share, about 20%, in the country’s power generation capacity. SMC is also investing in mining through a stake in the Sagittarius Mines Inc., operator of the controversial $5.9-billion Tampakan copper-gold project in South Cotabato. Meanwhile, Ayala’s total wealth was pegged at $2.2 billion in 2012, 83% higher than his wealth in 2009. Aside from Manila Water (which is also lists as investors the World Bank’s International Finance Corp., UK’s United Utilities, Japan’s Mitsubishi Corp., as well as American and European investment firms), the Ayala group has interests in banking (Bank of the Philippine Islands), real estate (Ayala Land) and telecommunications (Globe). While conspicuously absent in the Forbes list, Manny V. Pangilinan is widely considered as among the richest billionaires in the country due to his various business interests including Maynilad and Meralco. Aside from utilities, Pangilinan also has interests in telecommunications (PLDT, Smart), infrastructure and tollways (Metro Pacific Tollways Corp. which operates SCTEX and NLEX), media (TV5 and various newspapers), mining (Philex Mining Corp.) and a growing number of hospitals (Makati Medical Center, Cardinal Santos Medical Center and Asian Hospital, among others). However, it must also be noted that these business interests are under the Hong Kong-based First Pacific Company Ltd., which is part of the corporate empire of Indonesia’s largest conglomerate, the Salim Group. The richest Filipino, based on the Forbes list, is Henry Sy, known for his chain of SM malls (the Philippines’ largest retail business) with a declared wealth of $13.2 billion in 2013. His wealth has increased by 277% since 2009, boosted by his expansion in the power industry through the NGCP, which because of Epira now has a monopoly over the country’s transmission system. His holding company, SM Investments Corp., saw its profits grow by 34% between 2010 and 2012. Sy’s BDO Unibank Inc., the largest bank in the country, posted a 61%-increase in its net income during the same period while SM Prime Holdings, which handles the SM malls, had a 29%-increase. Following Sy is Lucio Tan, whose wealth jumped by 194% to $5 billion during the same period. Tan’s Fortune Tobacco and American giant Philip Morris have partnered under the PMFTC Inc. to monopolize the local cigarette market. Between 2010 and 2012, PMFTC Inc. saw its net income swell by 3,189 percent. Tan also controls Tanduay, Asia Brewery, Eton Properties (notorious for occupational hazards), the recently merged Philippine National Bank (PNB) and Allied Bank, as well as the University of the East (one of the educational institutions included in the top 1,000 corporations). Enrique Razon came in a close third with $4.9 billion, an enormous 690% expansion from his wealth in 2009. Razon is known for his International Container Port Terminal Services Inc. (ICTSI), which makes its fortune from privatized ports here and abroad, but is also expanding into casino operation through Bloomberry Resorts and Hotels Inc., which operates the recently opened Solaire Resort and Casino. The fourth richest Filipino based on the Forbes list is Andrew Tan ($3.95 billion, 365% higher than 2009). He lists among his business interests the Alliance Global, which controls property developer Megaworld and the local franchise of US-based global food chain giant McDonalds. Like Razon, Andrew Tan will soon build and operate hotel and casino facilities at the so-called Pagcor Entertainment City in Manila. Completing the five richest Filipinos is David Consunji whose $2.8-billion wealth in 2013 an enormous 833% increase from his reported wealth in 2010. His main business interest is construction giant DMCI Holdings, which has also expanded to mining (Semirara Mining Corp.), energy (DMCI Power Corp.) and water (Maynilad). The Consunji group is among the most active in the privatization of power plants and IPP (independent power producer) contracts under Epira. 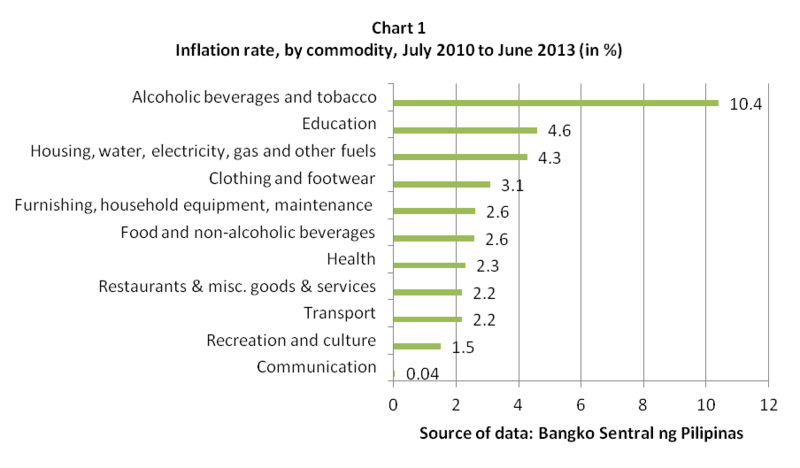 Wages and incomes could barely cope with the ever rising prices of basic goods and services. In Aquino’s first three years, the daily minimum wage in NCR has increased by just P52 – from P404 (June 2010) to P456 today. 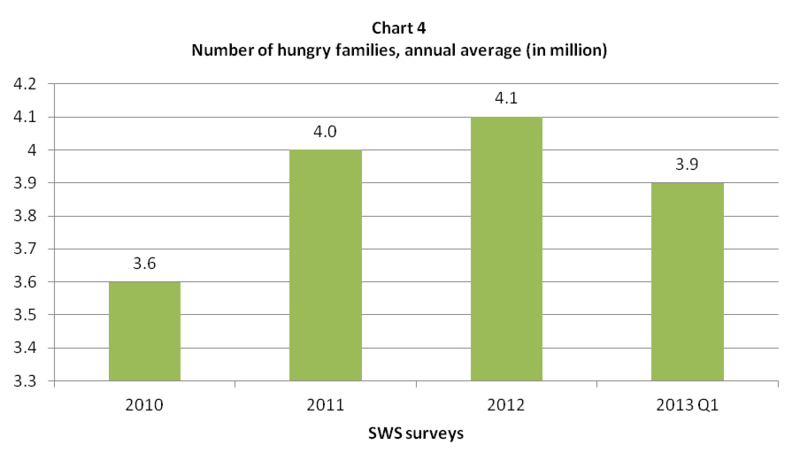 The family living wage, which approximates the cost of living or the amount needed by a family to meet daily basic food and non-food needs, was pegged at P983 in end-2010 and at P1,034 in end-2012, using think tank IBON Foundation’s estimates, or an increase of P51. This means that the wage hikes have just been wiped out by the increase in the cost of living. Thus, the minimum wage remained way below the amount needed for a family to live decently, pegged at 44% of the cost of living today. Aquino, in a recent speech, confidently declared that “the best is yet to come”. He promised that services will gain more speed in the second half of his term. Claiming to have realized that so many things still need to be done, the President said that his SONA will reflect the true state of the nation. But if Aquino will stick to the same neoliberal policies that further impoverish the poor, the people should expect the worst. After the SONA, those who live in Metro Manila face the prospects of higher water rates and fares in LRT and MRT. Maynilad and Manila Water are seeking basic rate hikes of P8.58 and P5.83 per cubic meter, respectively. The planned increases are part of the so-called rate rebasing under the privatization of MWSS, which has been further exposed as a highly onerous PPP deal. Consumers in other parts of the country like Bacolod and Davao are also confronted with higher fees due to privatization efforts aimed at their water districts. Meanwhile, LRT and MRT commuters will shoulder an initial P5 average fare hike that officials reportedly want to implement by August. Another P5-increase is set for next year. The fare hikes are part of Aquino’s plan to privatize the light rail system. LRT 1 is already slated for bidding this July with the groups of Pangilinan, Ayala, Cojuangco and Consunji as well as South Korean and Malaysian investors participating. The draft LRT 1 privatization contract provides for a regulatory risk guarantee wherein taxpayers will shoulder the cost in case the private operator could not implement a fare hike due to intervention by the courts or Congress. Power rates, on the other hand, will again rise as another round of increase in the universal charge is expected soon to recover Napocor’s stranded debts as mandated under Epira. This is on top of the regular increases in the generation, distribution, transmission and other charges. Oil prices will remain artificially high and volatile due to foreign monopoly control and deregulation. Even the price of rice is starting to climb up, increasing by as much as P2 a kilo last week due to the continued operation of rice cartels and privatization of the functions of the National Food Authority (NFA). Napaka detalyado at puno ng importanteng impormasyon. In my own personal opinion we Filipinos are very good in criticizing pero ano ba talaga bilang isang ordinaryung Juan na katulad ko ang pwede kong magawa maliban sa magpalabas ng mga hinaing at saloobin. Kasi yun nga eh lam natin ang mga detalye at impormasyun ng mga nangyayari sa ating kapaligiran. I suggest sana may mag post naman ng dapat nating maitulong sa ating naghihikahos na BAYAN. Yung kumpleto din sa graphs, surveys at kung ano ano pang mga statistics para mai apply natin sa pang araw araw na buhay nating mga Pilipino. Sana hindi rin ako lalabas na mahilig din mag criticize kasi ako rin aminado naman na la ako nababasa na mga nakalathala or mga post na magagandang bagay na magagawa natin para ma solusyunan and lumalalang kanser sa ating lipunan kaya ko po kayo hinihingan.